"Sharp Pools & Spas, Your Above Ground Pool Store!" 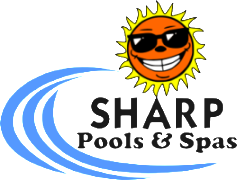 Here at Sharp Pools & Spas we carry a variety of brands and styles to meet your needs in Above Ground Pools. A wide selection of sizes, shapes and color are available for you to choose from to create the recreation, relaxation spot you ‘ve always imagined. We currently carry DOUGHBOY, CALIBAY, SEASPRAY and SWIM n PLAY brand pools. Please browse all for ideas and remember there are options to consider before making a selection. Our staff will be happy to assist you with sizes, liner choices and construction information. So stop by soon or just find our store number at the bottom of any page and give us a call. Vinyl Liner Replacement for your pool is one of our main services provided to enhance your pool experience. If it is time to replace your liner please give us a call to get the process started. Don’t let this interrupt the enjoyment of your pool activities in the coming seasons. As we get into warmer weather things get a little busy around here, so you will want to start early. We cover a large area for this service so don’t think we won’t come to you, call and ask. We provide pool liner replacements in Stone Mountain, most of Gwinnett County, Conyers, Loganville, Covington, Winder, Athens and Monroe!